Homeowners in Scituate, Mass. had us come out to show them samples of concrete flooring options for their finished basement. They really liked the sample board of concrete stain / dye in Walnut color. We explained that each concrete floor accepts color differently, and then stained a small sample area on their floor so they could see the actual color. Happy with color, and the agreed price — we stained and epoxy sealed the floor, (the floor was done using the same high grade system we use for commercial flooring). Are you working on a basement remodeling project? 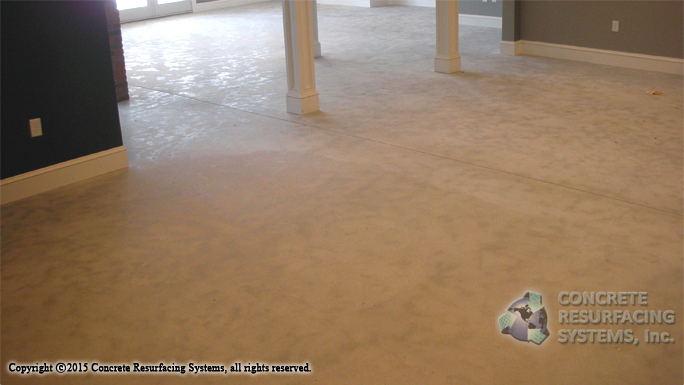 Concrete Resurfacing Systems has been installing basement flooring systems since 1995. We can bring sample boards of the actual products we’ll use on your floor, so you can see them in the room they will be used in, under its lighting conditions. 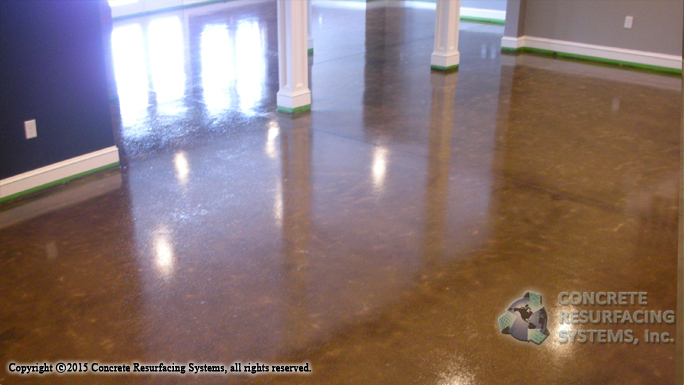 For products like concrete stain / concrete dye, if needed we can finish a small sample area directly on your floor.